Today as I went wandering through the garden looking for cleavers to photograph I was captivated by the variety and abundance of weeds growing everywhere. Healers all, I felt such a gladness come over me. Every square metre of ground let run wild, had a fabulous collection of medicinal plants. Under the orchard where we have neglected to mow for nearly 3 months, and with the spring growth it was just delightful. Represented were so many plants I am already familiar with and so many more yet to discover. Cleavers, quite a nondescript plant and more often a real annoyance to most gardeners has been used for centuries as a champion to assist with lymphatic drainage, and detoxifying the body. All over the world and throughout so many different cultures this plant has been used for the same purpose. Now to me that is really saying something, and I certainly won’t be looking at it in quite the same way anymore. Next time It’s burred seeds stick to my clothes I’ll discard them more carefully and bless them on their way. For more details read the full post. Common names; Clivers, goose grass, sweet woodruff, catchweed, goosegrass, gripweed, sticky-willy. 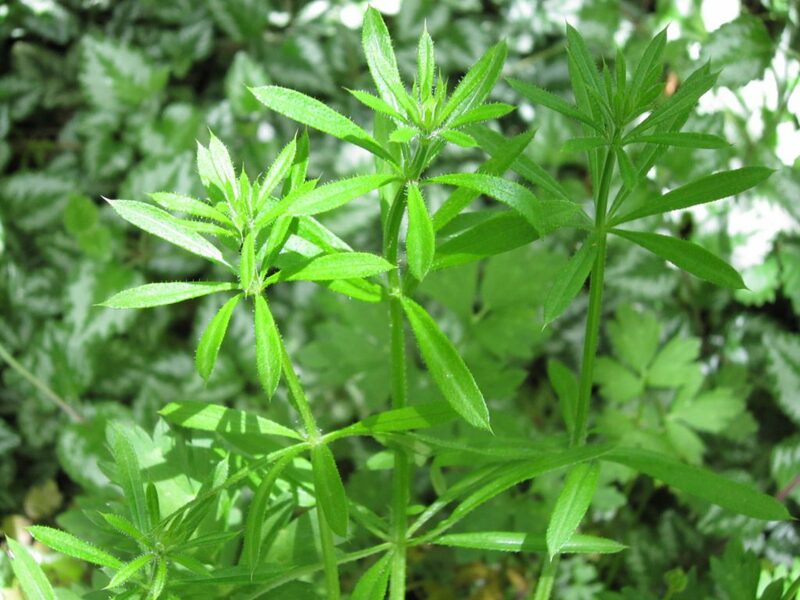 Description; Cleavers has a slender taproot with weak, square, slender stems. This annual can grow from 2 to 6 feet in length often forming matted masses and supporting itself by clinging onto other plants. Sometimes called the velcro plant it carries small curved prickles at the angles of the stems and on the veins and edges of the leaves. Leaves are narrow, lance-shaped and occuring in whorls of 6 to 8 along the branching stem. The flowers are white, tiny, 1/16 to 1/8 inch in diameter and star-like, growing in a stemmed bud rising from the leaf axils and arranged in clusters, six or eight together. These bloom separately 2 or 3 at a time so flowers and seeds are present in each cluster. The fruits are small burs also covered with hooked bristles appearing as two joined burs each containing one seed. Parts used; Whole above ground plant and seeds, harvested spring and early summer. Preparations; Fresh juice, tea/tisane from fresh or dried plant, infusion, compress/poultice, ointment/salve/cream, tincture/extract, homeopathic remedies, capsules. Habitat; Cleavers is found in moist or grassy places, along riverbanks, under hedges, in wastelands, amongst cultivated crops and up and along fences. This sometime invasive plant has naturalised worldwide, it’s origin unknown. Traditional and Historical uses; In Chinese medicine cleavers is regarded as a tonic and a blood cleanser, used for breast cancers, skin cancers, liver cancer, leukaemia, dropsy, high blood pressure, urinary complaints, gastric ulcers, skin infections and weight loss. In traditional European medicine has been used to treat various cancers. In old Herbals it is extolled for its powers, and it is still employed in country districts, both in England and elsewhere, as a purifier of the blood, the tops being used as an ingredient in rural ‘spring drinks.’ Gerard writes of Clivers as a marvellous remedy for the bites of snakes, spiders and all venomous creatures, and quoting Pliny, says: ‘A pottage made of Cleavers, a little mutton and oatmeal is good to cause lankness and keepe from fatnesse. ‘In many indigenous cultures cleavers is often combined with other herbals, however there seems to be a general consensus that it is a lymphatic drainage medicine and de-toxifying cancer/tumour treatment. Therapeutic actions; Bitter and cooling, anti-inflammatory, antiphlogistic, aperient, astringent, depurative, diaphoretic, diuretic, febrifuge, lymphatic tonic and vulnerary. Current herbal uses; Externally; the fresh leaves can be applied to cuts and wounds, or to help stop bleeding and enhance healing. The leaves also soothe burns, sunburn, acne, and other skin inflammations. The fresh plant or juice is used as a medicinal poultice for wounds, varicose ulcers and many other skin problems. Internally; A valuable diuretic, it is often taken to treat skin problems such as seborrhoea, eczema and psoriasis, and as a general detoxifying agent in serious illnesses such as cancer. It has a mild laxative effect and stimulates the lymphatic system. An infusion of the herb has shown of benefit in the treatment of glandular fever, tonsilitis, hepatitis and cystitis. The infusion is also used to treat liver, bladder and urinary problems. It seems that cleavers acts as a cleansing tonic that aids in releasing and draining toxins from the body, by acting on the lymphatic system. Hence it’s usefulness in glandular fever, swollen or enlarged lymph glands, prostate problems, swollen adenoids and tonsils. 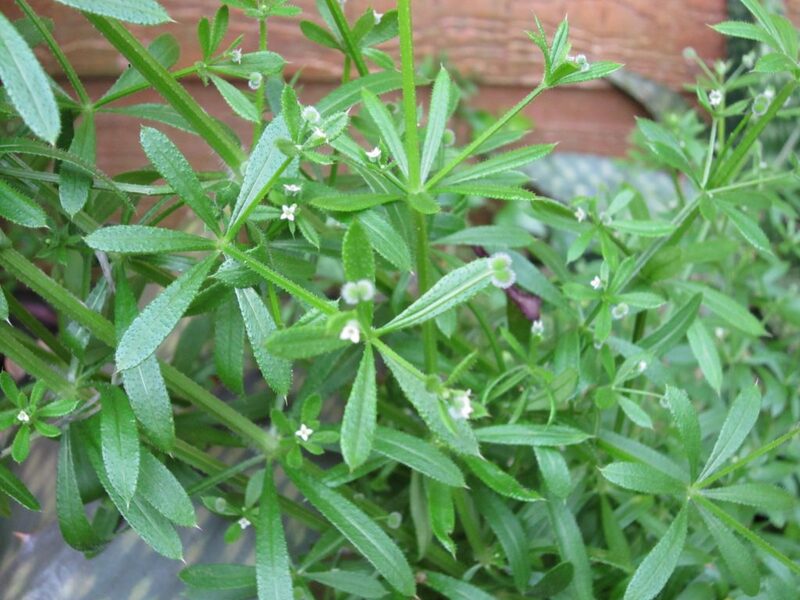 Cleavers can be used as a detoxifier in cancer treatments. Works as a diuretic promoting an increase in the flow of urine and releasing toxins from the kidneys and bladder and treating inflammatory urinary disorders. Food uses; as a pot-herb and an addition to soups. Cleavers seed can be used as a coffee substitute, the seeds are dried and lightly roasted. Naturally by Trisha products containing cleavers; Massage wax, Solar-x, Forever face cream.